BenJarvus Green-Ellis was clearly down by contact. 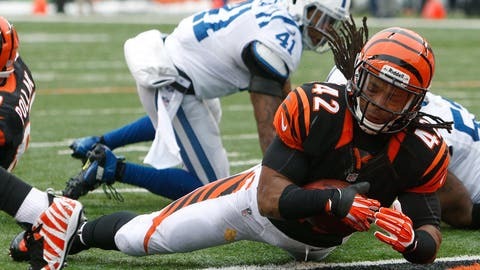 The folks in Indianapolis are not going to be happy with a very questionable fourth-down call made in the Colts-Bengals game, in Cincinnati, and unfortunately, they have every right to be. Here was the situation: Cincinnati had the ball, fourth down and goal from the Indianapolis 1-yard with 1:14 left in the second quarter. Cincinnati led 7-0. Bengals running back BenJarvus Green-Ellis took a hand off and appeared to be tripped up Indy tackle Josh Chapman short of of the goal line. After a review, the call was reversed to a touchdown, which gave the Bengals a 14-0 halftime lead. There’s no way you can overturn this. The ruling on the field was made that Green-Ellis was down by contact. Even though there was clearly some indecision, when the line judge called referee Jeff Triplette over to ask him whether he thought contact had been made or not on Green-Ellis. But, the fact is, the ruling was that there was contact made and there was nothing to show there clearly wasn’t. You could even make a much stronger case that contact was made. There was nothing indisputable to show there wasn’t, which means they should have stayed with the ruling of being short and the ball should have been given to the Colts on the 1-yard line. It was a replay mistake that overturns a decision that was properly made on the field. And that should never happen. Triplette said in his pool report after the game that they only reviewed the action at the goal line. I don’t understand that. You have to review all aspects of the play to see if Green-Ellis was not tripped up. If he didn’t see the shots, then that is the replay official’s fault for not showing him. But even if he didn’t, Triplette should have asked for them because you can clearly see that Green-Ellis was stumbling. This just added yet another layer to the confusion to this play.